2. Joy, Benny Little Girl, Little Girl [unissued] uniss. 5. Joy, Benny Bundle Of Love [vers. 1] [unissued] uniss. 11. Joy, Benny Memory of Memories [unissued] uniss. 12. Joy, Benny I Remember Darling [unissued] uniss. 13. Joy, Benny We'll Meet Again [unissued] uniss. 14. Joy, Benny Don't Forget About Me [unissued] uniss. 18. Joy, Benny Let's Be Friends [unissued] uniss. 19. Joy, Benny If I Had You [unissued] uniss. 21. Joy, Benny Night Owl [unissued] uniss. 23. Joy, Benny If You Were Mine [vers. 1] [unissued] uniss. 24. Joy, Benny Ittie Bittie Everything [alt. vers.] [unissued] uniss. 26. 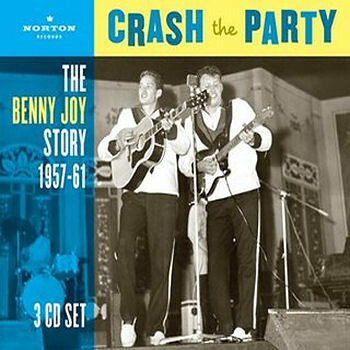 Joy, Benny Crash The Party [alt. vers. 1] [unissued] uniss. 27. Joy, Benny Forever, Now or Never [vers. 1] [unissued] uniss. 30. Joy, Benny Hold My Hand [unissued] uniss. 34. Joy, Benny Nowhere [unissued] uniss. 35. Joy, Benny Crash the Party [alt. vers. 2] [unissued] uniss. 36. Joy, Benny ' Hey' ... High School Baby! [alt. vers. 1] [unissued] uniss. 37. Joy, Benny I Really Really Care [unissued] uniss. 41. Joy, Benny Steady With Betty [alt. vers.] [unissued] uniss. 42. Joy, Benny Don't Make A Fool of Me Baby [unissued] uniss. 43. Joy, Benny Don't Boo Hoo Mary Lou [unissued] uniss. 44. Joy, Benny If You Were Mine [vers. 2] [unissued] uniss. 45. Joy, Benny Lucky Little Old Me [unissued] uniss. 46. Joy, Benny Only One [unissued] uniss. 47. Joy, Benny Bundle Of Love [vers. 2] [unissued] uniss. 48. Joy, Benny Dearest Darling [unissued] uniss. 52. Joy, Benny I'll Never Have The One I Love [vers. 1] [unissued] uniss. 57. Joy, Benny Cutie Pie [unissued] uniss. 59. Joy, Benny Gypsy Woman [unissued] uniss. 62. Joy, Benny Love Zone [unissued] uniss. 63. Joy, Benny Instead of Me [unissued] uniss. 64. Joy, Benny I'll Never Have The One I Love [vers. 2] [unissued] uniss. 65. Joy, Benny Only Time Will Tell [vers. 1] [unissued] uniss. 66. Joy, Benny ( What'll I Do) Call the Zoo [unissued] uniss. 67. Joy, Benny Follow Your Heart [unissued] uniss. 68. Joy, Benny I Never Want to See You Again [unissued] uniss. 69. Joy, Benny Eyes of Tears [unissued] uniss. 70. Joy, Benny Bring Me Back My Love [unissued] uniss. 71. Joy, Benny Only Time Will Tell [vers. 2] [unissued] uniss. 72. Joy, Benny Forever, Now or Never [vers. 2] [unissued] uniss. 73. Joy, Benny How Could Someone So Good Turn out So Bad? [unissued] uniss. 74. Joy, Benny Give Me Back My Heart [unissued] uniss. 75. Joy, Benny Queen Of My Heart [unissued] uniss. 76. Joy, Benny Touchdown [unissued] uniss.